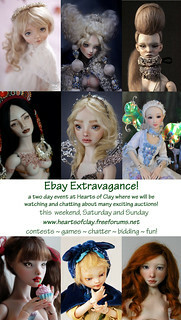 Event on Hearts of Clay! Hearts of Clay is hosting an this weekend to celebrate each artist and watch the auctions together. You might think of it as a party hosted by the beautiful Cinderella by Marina Bychkova, and many other beautiful dolls have been invited!